Last month I was courteously sent the October Edition of the Allure Beauty Box. I thought it was very nice of them to send me a box to have and take a look at. I used to subscribe to the service until I could no longer afford it. Actually, I used to subscribe to a good number of the beauty subscription services until I could no longer afford to keep subscribing to them. One of my favorites was always the Allure Beauty Box. I will tell you why. With the Allure Beauty Box, every month you get at least two full size products, it is editor curated (meaning that the editors of Allure magazine have helped pick out products that go into the box), the samples in the box are all of large deluxe size and you feel as if you are really getting your money's worth. In this box you also get an Allure "mini-magazine" that discusses the top trends and colors for the season. In the October Edition of the Allure Beauty Box I received the following products: Spongellé Body Wash Infused Buffer in Freesia Pear (full size), mally Volumizing Mascara (full size), Klorane Dry Shampoo With Oat Milk (deluxe size), Tatcha Indigo Soothing Silk Body Butter (deluxe size), Briogeo Don't Despair, Repair! deep conditioning mask (deluxe size) and doucce Freematic Eye Shadow in Kristi [deep copper] (deluxe size). The majority of these items are items I would use already or would try out if given the chance. I am especially interested in the body buffer, the mascara and the dry shampoo. The Klorane Dry Shampoo is known as one of the best dry shampoos on the market, if not the best. Just having a deluxe size of this is nice. I can put it in my purse to keep with me. Or keep for travel. mally beauty's Volumizing Mascara is also well known. It has a good reputation and I am anxious to try it out, as I could always use another good mascara to have around. I had tried a Spongellé foot buffer before and loved it. So I am excited to try the Spongellé body buffer with the Freesia Pear scent (which is heavenly, by the way). I've not heard of Briogeo before, but I could always try out the deep conditioning mask and see how well it works. And the doucce Kristi shimmer eye shadow is very pretty. It will go well with my eye color. The Tatcha Body Cream smells heavenly. It's blue, which is why it's called Indigo. But I don't care, I want to smooth it all over my dry skin and take in that intoxicating scent. To join and get the Allure Beauty Box, it's $15.00 per month. Or you can pay ahead and get a full year for $165.00 and get a free month when you do that. What is great is that you can cancel anytime without penalty. At $15.00 per month it's very competitive with other beauty box subscriptions that are around right now. And I do believe that you get either more in this box or what is comparable to what you get in other boxes for a lower price. Right now there is a limited time holiday offer that your first four beauty boxes are only $10.00 per box. That's $20 in savings! 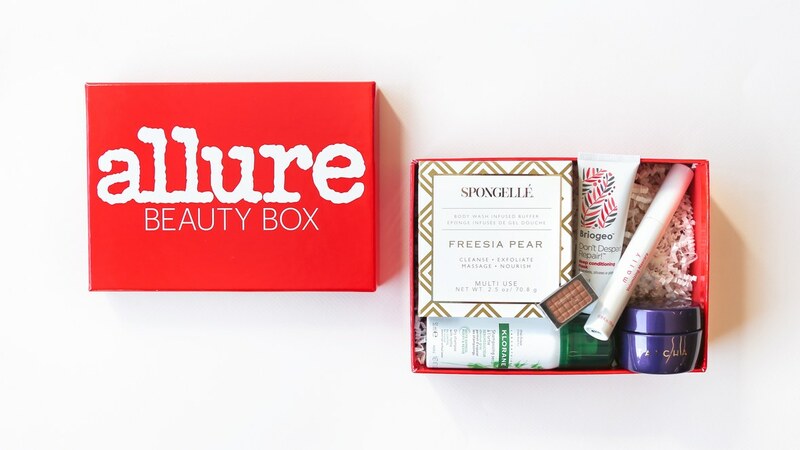 Subscribe today and enjoy the Allure Beauty Box. Subscribe here: https://subscribe.allure.com/subscribe/allure/108990?source=google_sem_holiday#ten. Or email them at beautybox@allure.com. Like Allure on Facebook:https://www.facebook.com/allure; Follow Allure on Twitter:@Allure_magazine; Follow Allure on Pinterest:https://www.pinterest.com/alluremagazine/; Follow Allure on Instagram:https://www.instagram.com/allure/; Follow Allure on Google+:https://plus.google.com/+Allure/posts and Subscribe to Allure on YouTube:https://www.youtube.com/user/AllureMagazine.